Boxship Deployment Trends: New Locations Are Key-ASB Logistics Co. Ltd - Your reliable international Heavy-lifts project logistics parter. Three years ago the majority of containerships sized 8-12,000 TEU were deployed on the Asia-Europe route. In the period since, this sector of the fleet has expanded considerably, whilst also diversifying in deployment, and these ships are now viewed as the future ‘workhorses’ of container trade. In addition, the sector’s recent deployment trends have represented a key aspect of active supply management. The 8-12,000 TEU sector of the boxship fleet numbered 539 vessels of a total 4.8m TEU at the start of March 2016. This represents around 25% of overall fleet capacity. Investment into the sector has been significant in recent years, motivated by the economies of scale and potential flexibility in deployment of these relatively large vessels. The focus on investment into the very large boxship sizes, particularly into the 12,000+ TEU size range, has increasingly motivated the deployment of 8-12,000 TEU vessels beyond the traditional Asia-Europe option and onto the Transpacific, and increasingly, larger non-mainlane routes. In March 2013, one fifth of containerships sized 8-12,000 TEU were deployed on Transpacific services. This share has increased to one third, or 166 ships, by March 2016. Meanwhile, the number accounted for by the North-South and non-mainlane routes rose dramatically from 43 to 213 ships in this period. The firm pace of deliveries into the 8-12,000 TEU sector partly explains these trends: the fleet grew by 50% in vessel terms between March 2013 and March 2016. But these trends have also been driven by ‘cascading’: as very large vessels have been delivered, and upsizing on the Asia-Europe route has advanced, relatively smaller ships have been redeployed elsewhere, chiefly the Transpacific trade but also large North-South and non-mainlane East-West routes. As a result the share of the sector servicing the Asia-Europe route fell from 66% in March 2013 to 22%, or 108 ships, in March 2016. A lack of trade growth led to an acceleration in the ‘cascade’ off the Asia-Europe route in 2015. Non-mainlane trade growth also slowed last year, limiting redeployment opportunities. In the 12 months to March 2016, the number of 8-12,000 TEU ships deployed on the Asia-Europe route fell by 54, whilst deliveries into the sector totalled 69. However, deployment elsewhere only rose by 86 ships, giving rise to a 30-40 ship ‘surplus’ in this period. This eroded Post-Panamax charter rates in 2H 2015, with the guideline three year rate for a 9,000 TEU ship down 30% y-o-y by end February 2016. 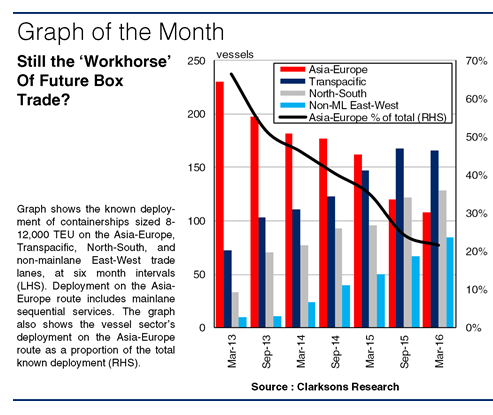 With deliveries of very large boxships set to remain firm this year, more ‘cascading’ off of the Asia-Europe route looks likely, which would maintain surplus capacity pressure. Redeploying these 8-12,000 TEU ships will become more challenging if Transpacific services upsize to very large ships, as CMA-CGM plans to do in May. In the short-term, the degree to which key non-mainlanes can absorb surplus capacity will be largely determined by trade growth on these routes. However, in the long-term this sector remains on course to assume a wide role in the global transportation of boxes.